We continue to do as well as can be expected at this stage of Lea’s recovery, I believe. We have been back in Indiana a little over 100 days now. She is progressing, though very slowly, which is no surprise after the massive trauma to her body. She gained 4.25 pounds in the last month, which is a good thing . . . she is still about ten pounds underweight, and can’t gain much because of her low fat, high calorie diet (oxymoron?). She has no lack of appetite, however, and eats hearty meals, but is still very slow to put on much weight. She is, however, beginning to look better as she is starting to get some muscle tone back. The pancreas has stopped draining from her abdomen. She has had no drainage since March 11, and the pin-hole opening in her stomach appears to be completely healed over. I continue to put the impregnated dressing on her skin graft each day, and will continue until we are certain there is no path for infection to enter from that area. The skin graft is looking very good, and we have had no more flare-ups since the fluid stopped draining out onto it. This closing of the wound, of course, is what we had been praying for, and now, ironically, we live in fear each day that she will get an abscess from the pancreatic fluid being retained in her abdomen. She gets somewhat bloated in the lower abdomen during the day, but it routinely recedes during the night, and she starts each day with a flat tummy, which is one of the first things we look for each morning, and then give thanks. She is still quite weak, and disappointingly feeble. She has continuous pain from arthritis in her hips, shoulders and neck, much of which probably results from her time in the ICU, and a hospital bed. Her neck and shoulders still have the curvature they assumed while in the coma on the air mattress, and we continue to work on getting her posture back. She still has a pinhole opening in her neck where the ventilator was in place for so long. She will probably have to have the ventilator hole surgically closed up, and, of course, will someday need to have the skin pulled up over her abdominal wound to provide some protection from trauma. But those are both down the road some distance; at least a year from the date of her release from the hospital last January, due to her overall physical condition. We continue to work each day for improvement in her stamina and general health. I am encouraging her to drink protein shakes each day, and her fingernails grow unbelievably fast. Her hair goes quickly, too, and the bald spot on the back of her head, caused by being in bed so long, has filled in nicely. Her hair is taking on its former bounce, which makes her feel better about her appearance. We go get her nails done and her hair cut fairly often, and it always seems to brighten her day. She is still sleeping more each day than she is up out of bed, although she is becoming more active in several activities, actually running the vacuum cleaner occasionally, cooking once in a while, and doing laundry. She even planted a few flowers in pots a couple of weeks ago, but hasn’t been able to finish the planting yet, as we are still sorting through box after box of things packed for us by friends and family while we were in the hospital. We do physical therapy two or three times a week at the hospital’s center near our new home, and she has already increased the amount of weight she is lifting, the number of repetitions she does, and works on improving the time it takes her to do the exercises. She has, in fact, doubled the amount of weight she is lifting during full arm extensions. . . she is up to TWO pounds! I also try to keep her entertained and mentally alert. I keep her moving, and am always looking for things we can do to keep her from becoming a couch potato. She is currently looking through the dozens of photo albums she has assembled over the years, with the intention of reducing them to a much smaller number. She has opened her email a couple of times recently, and even sent a message to one of her dear friends, but hasn’t really gotten very interested in resuming correspondence. 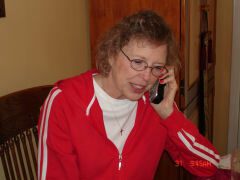 Her best therapy right now is visits from friends and loved ones, and getting out of the house to do normal activities. We have had a few of her dearest friends stop by for a visit, and one day a couple of weeks ago I drove her into her office, where she got to visit with many of her co-workers for the first time since our return. She really enjoyed getting to see everyone, and was quite talkative about the visit for several days. It was a delight for me to see the folks interacting with her, because they had surprised me so much with their expressions of love and deep concern for Lea while we were in the hospital. I know almost all of the folks she works with, but didn’t know how deeply she had touched each of them. Our friends Pat and Joe come over each week to spend a couple of hours with us doing some sketching, watercolors, or acrylic painting. We enjoy the time together, and although Lea has a hard time staying interested in doing any projects, she has done a couple of nice pieces, including a watercolor of ballet shoes she sketched from memory. 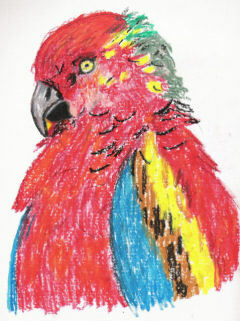 Pat introduced her to oil pastels this past week, and Lea created the attached sketch of a parrot, which shows that she is getting much of her agility and concentration back. Her sister, Kathy, and husband Danny, came up from Missouri to visit us again last weekend. They have been wonderfully supportive since we returned to Indiana, coming to help us sort through boxes and get organized. Danny bought some pegboard and lumber this past weekend and helped me get some of our garden tools organized and up off the garage floor. Meanwhile, Kathy helped Lea with sorting, decorating, and disposing. We took several more boxes of cast off goods to Goodwill. We are also in the process of selling the house where we ran our bed and breakfast. We have a prospective buyer, wonderful family and friends who are coordinating the process for us, and are, hopefully, in the closing days of negotiating the sale. That will be a bittersweet relief in many ways, but the Lord is leading us, and we are ever trusting that He will provide for all our needs. We have made a number of trips to the B&B to continue sorting through furniture and fittings, and have given untold amounts of possessions to friends, family, and Goodwill. We just simply are not going to have room for many of those things we so valued in our bed and breakfast days, and it is time to pass those items along to others who can enjoy them. All in all, we are pretty happy in our current situation. We are close to the medical services we need, and have a large number of recreational opportunities available to us as well. Although we are kept pretty busy just managing her medical needs, we will be able to get out and do more as her stamina improves and her ability to be more active increases. It is just a matter of fact that we have to be guided by her condition at this point in time, and that patience is going to be required of both of us for the foreseeable future. We had hoped to make a trip in late April to Missouri to attend the annual meeting of an organization I belong to, but Dr Miller advised against it. We would have to travel many hours each way by car, and Dr Miller was concerned that blood clots could still be an issue for Lea, and urged us to miss the event this year. Travel for us is going to have to be limited to relatively short trips for a while, so we are encouraging friends and family to take advantage of our guest bedroom until we are able to return the favor. We plan to attend her brother, Jim’s, hog roast on May 20. Maybe we’ll see you there! Thank all of you for your wonderful support while Lea was in Hartford , and for your wonderful support since our return to Indiana. I couldn’t begin to express how uplifting for me your emails and eGreetings were during the weeks of her coma, and how important they were in helping me reach her subconscious during those days. I look back now and recall the times her heart stopped, or her lungs failed, and it just brings tears to my eyes. You were the strength that helped me help her. For that, I can not thank you enough. I can find comfort, however, in knowing that He knows what that was all about, and that you will receive your reward directly from Him. May God bless you and keep you! And, please know that you will always have a very special place in our hearts, and in the hearts of others with whom your caring touched a special nerve, and, perhaps, brought someone a little closer to Him.